A contemplative read which demands to be read, absorbed and reflected upon. Cleverly and carefully it lays the groundwork before revealing what happened on That Dark Remembered Day. The narrative is shared between Stephen, now a technician at a university but at the time the book opens, in 1983, an awkward teenager, his mother Mary and his father Richard. In 1983 Richard had returned from the Falklands, his final posting before discharge from the arm and at its heart, this book is a reflection on the damage that war inflicts on those who are sent to fight. Stephen’s story is the thread that runs through the book as the author first presents Mary’s perspective, her excitement of a new venture in becoming self-sufficient in their new home Highfield, how daunted she was when her husband returned coupled with her doubt on how to deal with the shadow of the man he was before. Richard’s story, coming later, is a brutal depiction of a reluctant soldier, so raw and descriptive that it made me re-evaluate those half-remembered news stories of my own childhood. Tom Vowler’s assured writing covers huge themes, of mental illness, bullying and takes an accurate look at small town mentality where close-knit masks acts of cruelty to those deemed not to belong. When Stephen returns to the town he vowed never to return to he wonders whether the intervening years would have softened the memories, lessened the hurt and that the stones hurled before he left, would this time be left to lie by the roadside. It took me a while to warm to many of the characters in this book, which says less about the writing than the fact that this ‘psychological suspense’ really does a fantastic job of peeling back the layers of the key protagonist’s minds. The power of the writing meant that it was only once I’d closed the book and reflected on the many aspects, that the compassion I feel for this fictional town’s inhabitants is fully felt, as whilst in the grip of the book I was barely able to imagine the horror that the whole town experienced. 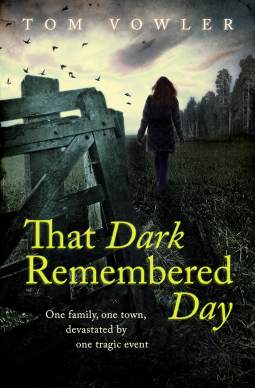 That Dark Remembered Day is a compelling read that uncovers the mind of everyone that was witnessed the awful events of the day in question as well as examining the effects, years later, on Stephen, his first girlfriend Suzanne and his friend Brendan years later. Due to be published on 13 March 2014 by Headline, I was grateful to receive a copy in return for my opinion on Tom Vowler’s second novel. Tom Vowler’s debut novel What Lies Within was also a thoughtful psychological suspense novel rather than a thriller and like That Dark Remembered Day was a fresh and unique take on the genre. It was so good that it made my Top Ten List for 2013. Both of these sound great. I think I’d like to start with What Lies Within first. Good choice Rebecca. On balance I think What Lies Within has a wider appeal although I enjoyed the hard-hitting aspect of That Dark Remembered Day too. Thanks for the review! I’m glad to hear you liked this one so much. I’m fascinated by books that deal with psychology. You make this sound wonderful – I have both books and you’ve pushed them right up my list of priorities. Thank you! This one was quite hard to read in places but incredibly powerful, I get the feeling that I will be thinking about it for some time. I do hope you enjoy them both! Sounds fascinating, and very different from What lies Within, though it was the way he got inside the protagonist’s head in that one that worked so well too, I suppose. Hope to be reading this one in the next couple of weeks. I had moments during this book where I really wasn’t sure I was enjoying it but it is the way this one all comes together that meant despite this it ended up with 5 stars… certainly a book that has lingered in my thoughts!